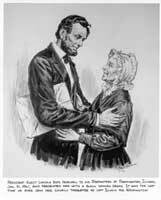 Ostendorf Positives -President-elect Lincoln bids farewell to his Stepmother. Subject: President-elect Lincoln bids farewell to his Stepmother. Description: President-elect Lincoln presents his Stepmother with a black woolen dress as he bids her farewell on January 31, 1861 at Farmington, Illinois, shortly before he left Illinois for Washington. It was the last time he ever saw her. A color portrait was made of this scene, and hangs in either Mattoon or Charleston, Illinois. Copyright © 2005-2009 Interactive Data Technologies.